If you are like me (and I know you are) then you like to spread Christmas throughout the house. I've found that bathing my dog outside, even in summer, is especially difficult. He just wants to run away. 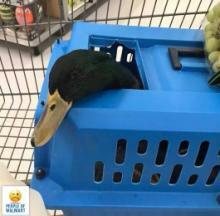 Attention Walmart shoppers: Don't get caught with your duck out, confine it to a carrier like one daffy doofus did. This year Dad baked me some homemade dog biscuits for Hanukkah. They are in the shapes of Stars of David and menorahs. I have found the perfect spot from which to keep an eye on the dog and sneak up on him when he least expects it. A Laysan albatross named "Wisdom" arrived at her nesting site on November 29 and laid an egg on December 5. What is unusual is that Wisdom is 68 years old.